Wm. 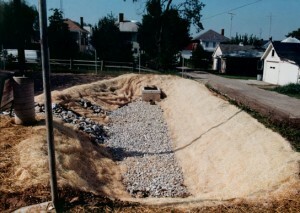 F. Hill and Assoc., Inc. has designed many stormwater management facilities ranging from single family homes to commercial, residential and industrial developments. Various methods of stormwater retention and management have been utilized including; wet and dry detention ponds, underground storage, infiltration systems, permeable concrete structures, bio-retention areas, and green roof stormwater management designs. 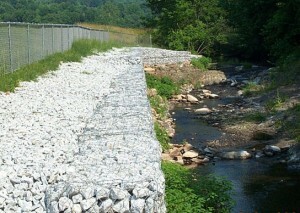 In addition to stormwater design, our firm performs culvert designs for stream crossings, stream restoration, flood plain analysis, NPDES permitting and reporting, grading and erosion / sedimentation plans. The stream had been eroding the bank along an existing pond. bank and provide structural stability to the pond.